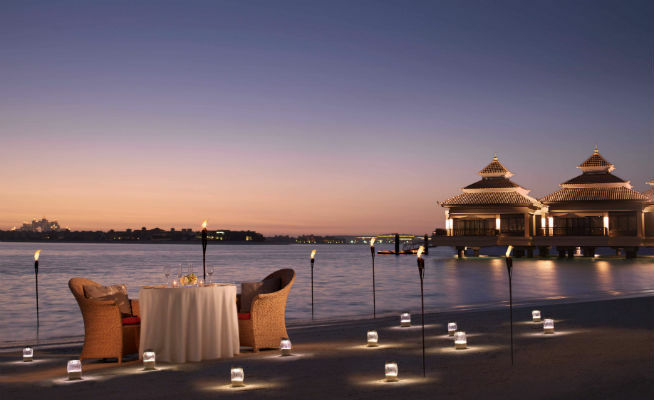 Whether you’re recently coupled up, or you and your other half are pure #relationshipgoals, we’ve taken the guesswork out of planning the perfect Valentine’s Day in Dubai. Not sure where you two stand on the ‘eating off each other’s plates’ issue? Take the guesswork out of whether or not to share with Fumé’s tasty sharing set menu. 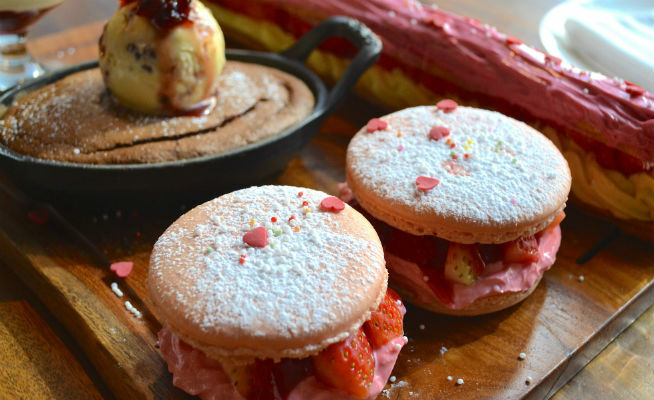 Available at both the Downtown Dubai and Pier 7 locations, the menu includes sharing dishes such as burrata with edamame, jumbo shrimp thermidor and strawberry macaroons. A vegetarian option is also available. Relax in the laidback surroundings of Reform Social And Grill’s lovely pub garden while you tuck into a yummy five-course tasting menu. Some of the highlights include an Angus beef fillet steak and a red velvet cake drizzled with white chocolate liquor. For a low-key date night, not much can beat a slice of pizza and a glass of red. 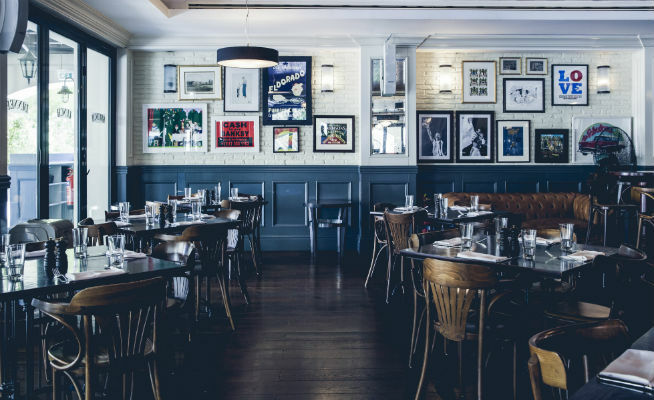 Spend Valentine’s Day at Jazz@PizzaExpress and you’ll enjoy a special three-course set menu for two and a bottle of wine, not to mention the smooth sounds of their live jazz band. Nothing says cool and casual like feeling comfortable enough to go nuts over a plate of chicken wings in front of your partner (or is that just us?). 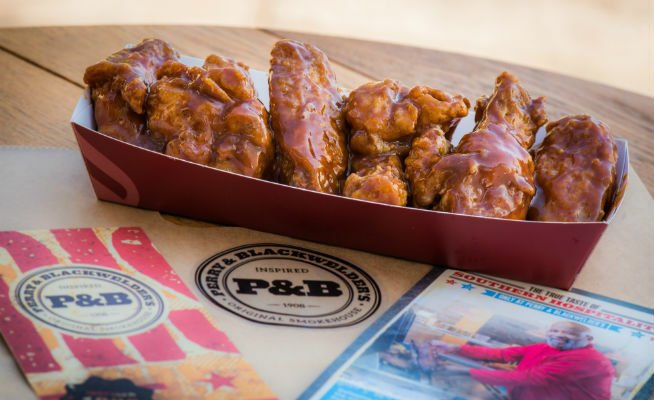 Forget feeling refined and elegant and prepare to get messy at Perry & Blackwelder, who’ll be serving platters of ribs, wings, fries and more, with sharing cocktails to boot. There’ll be live acoustic music from 9pm onwards. Enjoy the chilled out atmosphere of the Big Easy Bar & Grill as you tuck into a three-course menu, as well as free-flowing house drinks. There’ll be live music on the night too, as well as cool giveaways. Treat your beloved to a fabulous dinner at this What’s On Award winning restaurant. 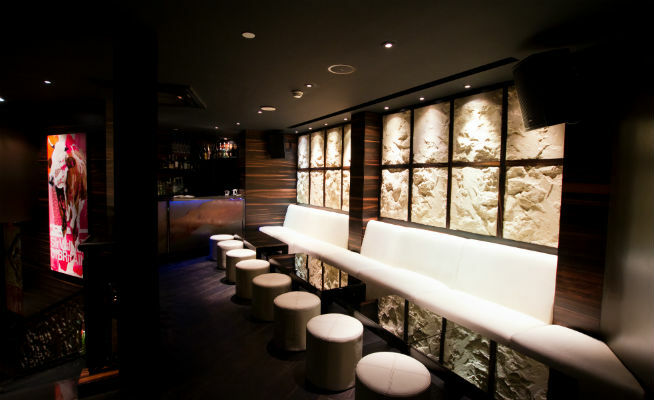 The special menu will feature some of Okku’s most famous dishes including the miso black cod and truffle grilled rice, paired with creative concoctions from the talented mixologists. 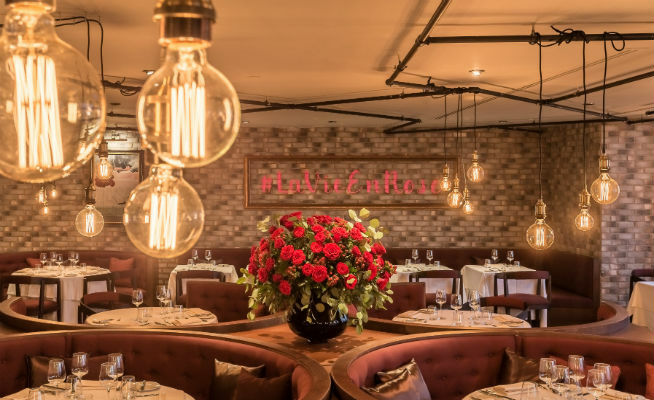 If you can’t quite afford to sweep your loved one off their feet with a surprise trip to Paris (we don’t blame you), the next best thing is to book a table at La Mome. The wonderfully old-fashioned French style bistro is one of Dubai’s most romantic restaurants. If it’s good enough for Leo – head here to see what we’re on about – it’s good enough for us. Make sure you share the addictive chocolate mousse for dessert. 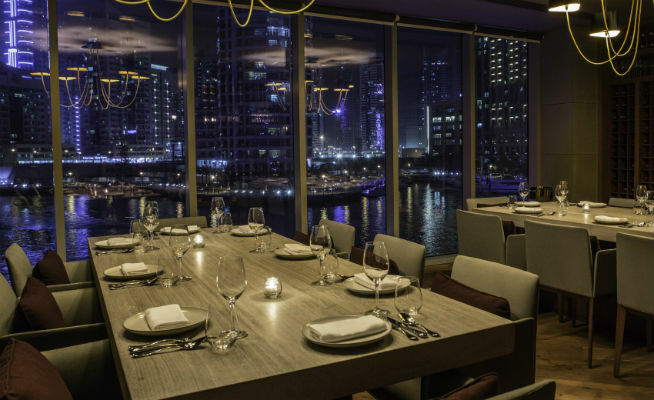 Jason Atherton’s flagship restaurant in Dubai Marina is going all out for Valentine’s Day, with a four-course set menu of his trademark high-end comfort food: think beef wellington with black truffle, confit duck and fois gras terrine and a banana and chocolate chip souffle. Add in the pretty marina views and you’ve got a pretty special evening. 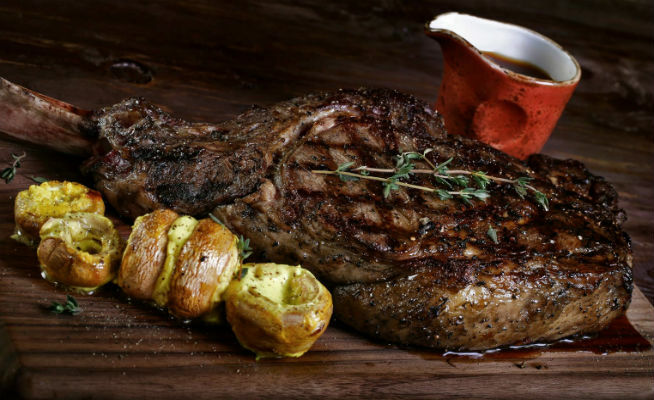 If your date is a steak lover, book a table at Ruth’s Chris. 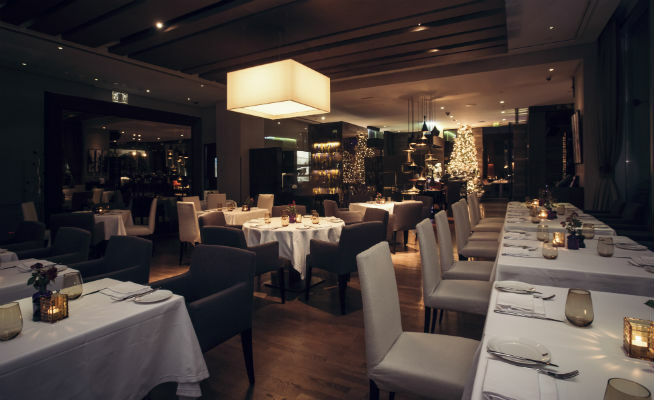 The Dubai Marina favourite is a reliable choice for a great night out, and they’re offering a special romantic four-course meal, complete with grape pairings. 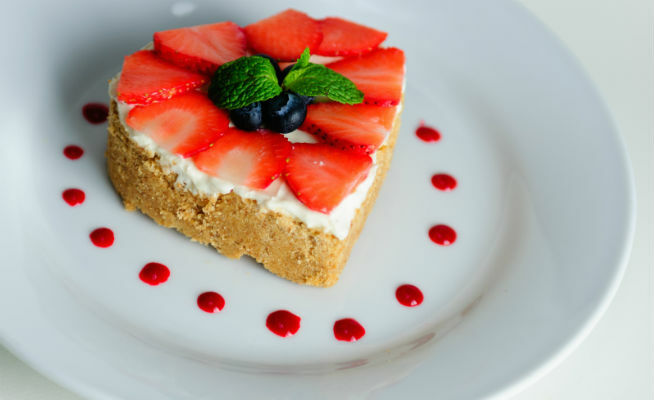 Along with their signature grills, expect indulgent dishes such as truffle mash potato, oysters and heart-shaped cheesecake. Enjoy a romantic night under the stars at three-in-one restaurant in Vida Downtown. 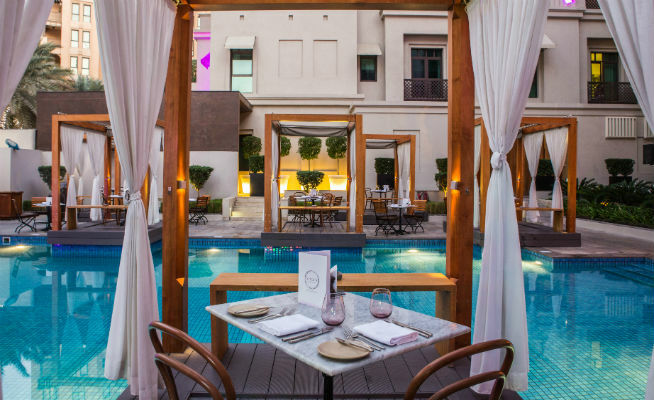 Settle in at one of their candlelit poolside cabanas for a special three-course menu, (with vegetarian options) paired with house drinks and a glass of champagne on arrival. 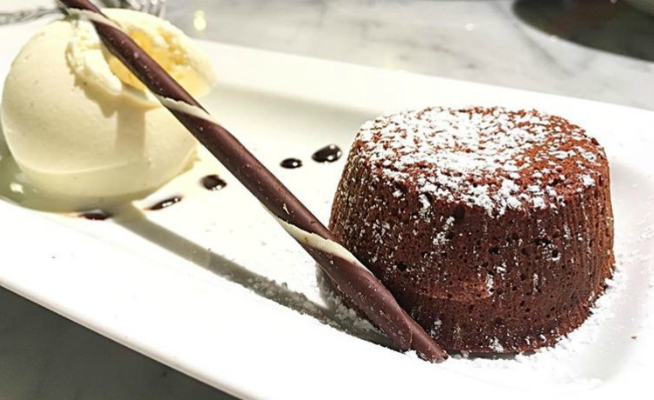 We like the sound of the ‘chocolate combustion’ dessert. 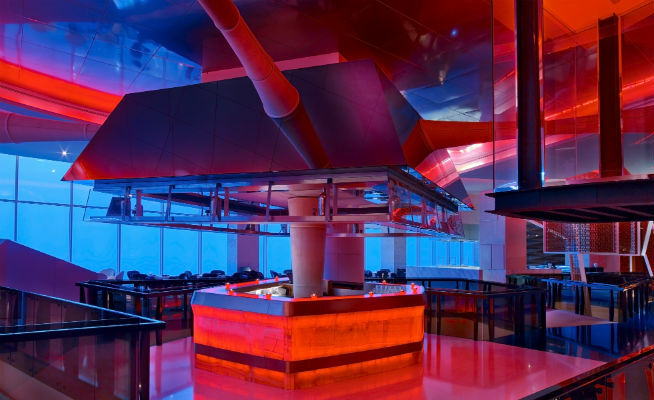 Experience the delicious fusion of Japanese and Korean cuisine at the stunning restaurant Namu in W Hotel. Book a table by the window and watch the Dubai Canal light up below you while you relax and enjoy four hours of bottomless bubbly. You can even keep the night going by paying Dhs100 for access to the party at the Wet Deck. One of the most romantic, secluded hotel hideaways, and they’ve pulled out all the stops for Valentine’s Day. 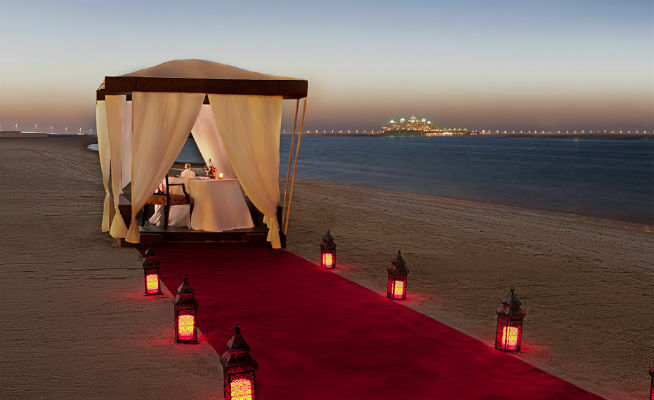 Book the bespoke Dining By Design experience and be treated to a candlelit dinner underneath the stars at a private table on the beach. Go all out with dinner at Roberto’s. The incredible San Valentino Balcony is a seven-course degustation menu that includes oysters, caviar and (of course) champagne. Book a table on the terrace under the stars. Experience an unforgettable Valentine’s Day at this opulent hotel with the indulgence of a private gazebo at Plaj. Be attended to by a private butler, tuck into a five-course set menu (with a bottle of rose champagne) and get all sorts of extra treats including a bouquet of flowers and vouchers for the stunning Talise Ottoman Spa.